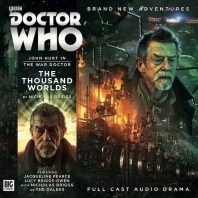 The audio foray into the life and times of John Hurt’s shrouded War Doctor continues with the second instalment of Only the Monstrous, ‘The Thousand Worlds.’ With the high-ranking Time Lord Seratrix trapped behind enemy lines, the man who has disowned the title of Doctor finds himself tasked with a rescue mission, and as the mysterious area of space known as the Null Zone severely restricts any room for manoeuvring, the recent past comes back to haunt him as times have changed on Keska and the Taalyens reveal their part to play in the Daleks’ ultimate plan. The backdrop of the Time War allows for the introduction and exploitation of fascinating concepts and ideas that can affect the fabric of reality and causality in the most horrendous and awe-inspiring of ways, and though the Null Zone itself doesn’t represent the dearth of morality that the Time Lords and Daleks share at this point, it’s not surprising that an area of space in one time that is impossible to reach by time travel would naturally become an object of fascinated preoccupation for the Time Lords who have for so long had everything at the tips of their fingers. Worse for the Doctor is the fact that the Daleks have overtaken Keska in its own future and added it to their legendary conquered thousand worlds, drilling to the planet’s core with immense machinery upon the surface and forcing the Doctor to realise and accept that no matter how much good he may try to do on a more intimate scale, the crushing inevitability of the might of the Dalek advance will always supersede his attempts at bringing peace. John Hurt once more gives an incredibly poignant performance as a man trying to reconcile his recent past and present with the ideals he once held so dear, and his surprising reunion with an older Rejoice who has tried to hold onto her own ideals on the Dalek-ruled Keska is played magnificently by both Hurt and Carolyn Seymour to fully allude to the emotional time they spent together so long ago. As the Doctor continues to appreciate the fact that the Daleks’ plans are only becoming more and more grandiose as time wears on, Rejoice forms an emotional tether of sorts for him, although the stories so far have not quite sufficiently explained why she should be so infatuated with the idea of saving the Doctor from himself given the acts of compassion and contrition she has personally seen. It’s mentioned over and over again that the Doctor has done unspeakable acts and will continue to do so, but the first two stories have shied away from showing the Doctor committing to that darker path even as his surroundings are plunged further into darkness. Indeed, while it’s immensely interesting to note just how much contempt for Gallifrey this version of the Doctor harbours and just how infuriated he becomes when Ollistra calls him by that name, ‘The Thousand Worlds’ in a way covers a lot of the same introductory ground that ‘The Innocent’ did and borrows heavily from several previous Dalek adventures regarding their actions and motivations, creating a feeling of sideways motion saved by incredible performances so far rather than a strong narrative thrust forward. Nonetheless, the covert Time Lord mission to infiltrate the Taalyen and Dalek hold is tense and well-scripted, and Seratrix’s seeming betrayal to Gallifrey but not to the Doctor himself as the Daleks he has allied with proclaim “Peace in our time” is a strong final image as Only the Monstrous heads into its concluding act.